Al-Qaeda was behind the foiled suicide bomb attack on a major Saudi oil facility on Friday, says a website used by Islamic militants in Saudi Arabia. The statement said the attack at the oil-processing plant at Abqaiq was part of al-Qaeda's campaign to force "infidels" out of the peninsula. 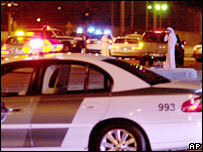 The Saudi government has said it foiled the attack and output was not affected. The al-Qaeda network on the Arabian Peninsula has long called for attacks on Saudi oil installations. On news of the attempted attack, the price of crude oil for April delivery leapt as much as 3.4% to $62.60 a barrel on the New York Mercantile Exchange, its biggest gain since 17 January. Oil security analysts have estimated that a serious attack on the facility could halve Saudi exports for up to a year. Friday's attempt at Abqaiq, near the eastern city of Dammam, was foiled when guards opened fire on at least two cars carrying explosives as they tried to ram the gates. At least one of the vehicles blew up, killing the occupants. Two of the guards were killed, and another two were wounded, Saudi officials reported. Al-Qaeda's apparent claim of responsibility was made on a website often used by militants, but could not be verified. Its operatives had succeeded in entering the plant with two car bombs, the statement said. The attack was "part of the project to rid the Arabian Peninsula of the infidels" and was intended to stop the "pillage of oil wealth" from Muslims. Saudi Oil Minister Ali al-Nuaimi said output at the facility, which handles about two-thirds of the country's oil production, was unaffected by the attack. He denied earlier reports on al-Arabiya television that the attacks had briefly stopped the flow of oil after a pipeline was damaged. An interior ministry statement said damage had been "limited to a small fire which was brought under control". Oil is processed at the facility to remove gas and render it less volatile. Saudi Arabia has been fighting Islamic militants in the country for the past three years. Attackers have previously targeted oil company offices and compounds housing Westerners, while Saudi security forces have killed dozens of insurgents.